With my second Chicago Marathon just over a week away, I can’t help but think back to my first marathon. Every marathon runner has a “My First Marathon” tale to tell. Usually they are stories about inspiration, dedication and perseverance. My first marathon story, on the other hand, is about lies, deception and a complete lack of backbone. The arc towards my first marathon can be traced back to just after I had kids. Although I’d always been a casual runner, I was not what you would call a devoted runner. I happily gave it up when I was pregnant because I was under the misguided impression that I should be taking it easy. Before I knew it, running was the last thing on my mind, as I was drowning in all things baby. Life was a blur of diapers, bottles, spit-up, laundry, loneliness and exhaustion. In my hours of need, I found myself reaching out to my old friends, Ben and Jerry. After putting the kids in bed at night, I would sit down with some Phish Food. The chocolate ice cream, swirled with marshmallow and caramel, reminded me that I had the strength to make it through the day. Every time I came across a chocolate fish hidden deep in the ice cream ocean, I would get a slight thrill, a little adrenaline rush. Sometimes it was the most exciting part of my day. Needless to say, I packed on the pounds. I continued waddling blissfully along that Phish Food-lined path, my pre-pregnancy goal-weight vanishing rapidly in the rear view mirror. When I decided to skip my college reunion because I had gained so much weight, I realized it was time to ditch my friends Ben and Jerry and renew my relationship with another old friend, running. I started to hit the pavement with my kids in the jogging stroller, one mile at a time. One day, a woman I knew from playgroup mentioned that she was a runner, too. “We should run together sometime,” she oozed enthusiastically. I looked at her as if she had just asked me to take a shower with her. I tried to hide the mix of shock and horror that I felt. Run with someone else? Ce n’est pas normal! Running was a solitary activity, a deeply personal experience, a time to be alone with one’s thoughts or one’s music. Run with another person? It was unseemly. “Um, okay,” I responded with a feeble smile, hiding my disdain. A few days later she called to see if I wanted to run that Saturday morning. It sounded like torture, and yet it offered the one thing I desperately needed to rescue myself from newborn-induced loneliness: friendship. So Saturday at 7:30 we met up and set out for 3-5 miles. To borrow a line from Casblanca, it was the beginning of a beautiful friendship. Don’t get me wrong, I still loved the moving meditation of running alone, but it turned out that running with someone else was kind of nice, too. Our inaugural run morphed into a regular event, and other friends started to join us. Saturday at 7:30 became the highlight of my week. One day, my friend suggested that we tackle the upcoming local 5k together. Once again, I looked at her with a mix of shock and horror. Run a race? At our pace? It was not as if we could win – we were solid 10-minute-milers. Why would we humiliate ourselves by running a race, with spectators, if we were sure to lose in such a sensational fashion? However, my friend’s unabashed enthusiasm was persistent. “Um, okay,” I deferred. And so my racing habit began. The 5k was fun, even if we didn’t win. Soon enough, we were signing up for every local 5k, 10k, and 5-miler we could find. It was a blast. 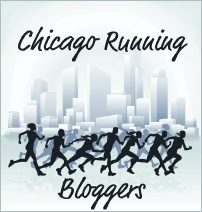 When I relocated to Chicago, I lost my running partners, but I kept my running habit. I jumped into the local racing scene. I even looked into meeting some friends in Florida for a half marathon. My travel schedule didn’t work out, but a couple of months later, those same friends asked me to join them on an all-female team for a running relay race. “Um, okay.” I had no idea what I was getting into. I wasn’t even sure what they meant by “relay race.” My mind flashed back to gym class in elementary school when we would pass a cold metal baton to each other as we did laps around the field. Was that what we would be doing? When I did research to find out, I was horrified. It was the S2S Relay, an overnight running race across the state of Florida. Our team would have 12 runners and between us we would cover 180 miles across the state. Each woman would run three legs of varying length, ranging from 3-8 miles. My assigned legs would add up to about 14 miles total. But one of those legs would be in the middle of the night. At 1AM. In the dark. Along an alligator infested lake. And when not running, we’d be sleeping in a van. It would take about 30 hours total. What in the world had I gotten myself into? The relay turned out to be exhausting but fun, in a strange way. As you can imagine, a bunch of women together in a van for 30 hours meant a lot of talking. One of the topics discussed was whether running a marathon or a relay was harder. I had never run a full marathon, so I couldn’t weigh in, but I knew a half-marathon was definitely on the outside edge of my comfort zone. All the other runners in the van, however, had done at least one marathon. Some had done several. They all agreed that the relay was harder than the marathon. The consensus was that while the overall mileage was less, the pace was faster and running three legs in quick succession was more taxing than a straight, steady long run. Yes, they all agreed, the relay was harder. Really? I had just done something harder than a marathon? I had always put a marathon under the category of Things That Are Absolutely Impossible for Me To Do, along with time travel, quantum physics, and ballet. I spent most of my life living or working on or near the route of the Boston marathon, and I made sure to watch the race every year. Every year, without fail, I was inspired and amazed by the runners, but I always said to myself “I could never do that.” And yet, these women were telling me that I could. I started to wonder, could I really run a marathon? 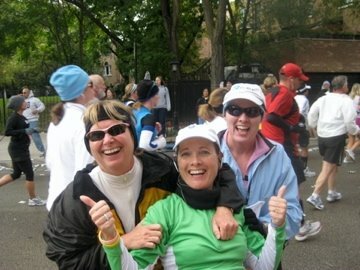 Four of the women on my relay team were coming to run Chicago Marathon the following fall. So there it was, my golden opportunity. I could run with friends, on a flat course, in my own back yard. And they all were telling me it was easy compared to what we had just done. They were more experienced than me, and without exception, they were better runners than me. Ultimately, their enthusiasm, coupled with my excessive diffidence, convinced me. I signed up for the Chicago Marathon. However, I soon realized it was a big, fat lie. Yes, staying up all night during a relay was challenging, and running while sleep deprived was no fun, but let me assure you, the marathon was harder: the training was harder, the mental challenge was harder, the race was harder. Yet somehow, that false mantra “It’s easier than the relay” got me to the start line, and once I was at the start, I figured I might as well get to the finish, even if it was not easier than running a relay. At the end, as I crossed the finish line, I realized I had done something I’d thought was impossible. After years of saying “I could never do that,” suddenly I could say “I did that.” It turns out I didn’t need inspiration; I didn’t need a life-changing event; I didn’t need goal-setting and perseverance. All I needed was the belief that I could do it, even if that belief was based on lies and deception. Now here I am, getting ready for my second marathon. It is just over a week away, but I am not worried because someone told me the second marathon is easier than the first. So I just keep repeating that to myself over and over again. It’s easier than the first marathon. It’s easier than the first marathon. It’s easier than the first marathon…. At Chicago Marathon with two of the friends who tricked me into doing the impossible. I am forever in their debt. The hammer! Getting ready to hit it! Now I have MC Hammer stuck in my head. But that is ok, he makes good running music. Thanks Heidi! And look at you now — it didn’t take a single lie this time. Go Sue! WOW! How cool I can watch you from afar in your #2. It’s not the first, it’s totally different. You’re gonna ROCK IT!! Thanks Ms V., you are the best long-distance cheering squad ever. Thanks! I will let you know how it goes. And you never know when you might hop back on the bandwagon….